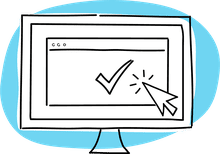 Headlines and other short phrases or blocks of text are often set in display type sizes of 18 points and larger. While readability is still important, there is more leeway for using fun or decorative typefaces in headlines. Beyond what the headline says, it needs contrast—of size or font choice or color—to make it stand out. Match headline fonts to the tone of the document. Choose a font for headlines that is appropriate to the tone and purpose of your publication. Does the font say ​fun or serious to you? Classic, serif typefaces and neat, orderly decorative fonts are typical of a formal page layout used for official or traditional communications and serious subjects. Along with classic serif and sans serif faces, there is often also room for more playful, decorative, or exotic typefaces in informal page layouts as well as child-focused layouts. Use contrasting font styles for headlines. Serif body copy and sans serif headlines provide good contrast. Avoid using headline and body copy fonts that are too similar in styles such as two different serif or sans serif fonts. Use bold headline fonts to add contrast. If using the same font for body copy and headlines, create contrast by setting headlines bolder and much larger than body text. Make headlines a different color than other text. Use color in the headline to create contrast but make sure there is enough contrast not only between the headline and the body text but also between the headline color and the background. Make headlines larger than body copy. Display and headline fonts are more readable at larger sizes than body copy fonts. For extremely decorative or elaborate fonts use even larger display sizes of 32 points or more in headlines. 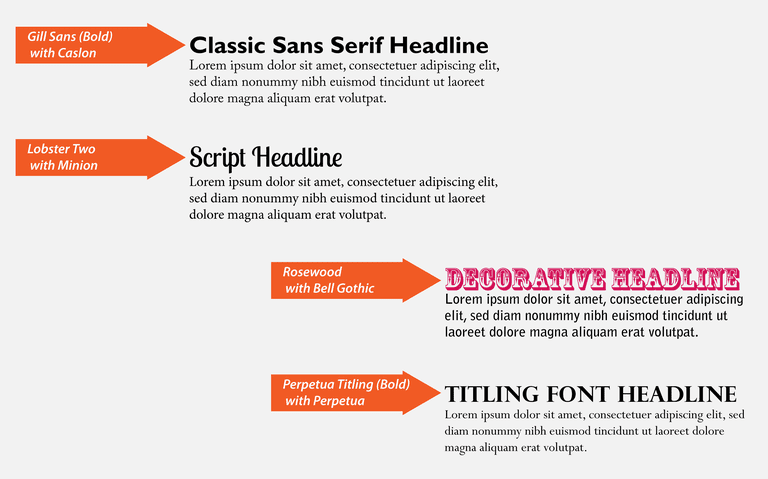 Create a headline hierarchy with headline fonts that look good in multiple sizes. Limit use of decorative headline fonts. Extremely decorative or elaborate display fonts, even at headline font sizes, are harder to read. Use decorative headline fonts in moderation and for shorter headlines. Set ALL CAPS headlines in small caps, sans-serif fonts or titling fonts. Serif, scripts, and elaborate decorative fonts are often much harder to read set in all caps. The serifs, swirls, and flourishes of each capital letter tend to interfere with the other capital letters making it difficult to identify individual letters and whole words. Consider using small caps or Titling fonts for serif headlines in all capitals or use sans serif fonts. With all caps, shorter headlines are better than long ones. Don't let headlines be squished. If you don't want to spend time kerning your headlines, try fonts that have better letterspacing and don't need kerning. It varies from typeface to typeface. Use headline fonts consistently. Try to use the same headline fonts throughout a multi-page publication, using variations consistently as well such as one style for major stories, another for secondary or sidebar articles.